It is essential for corporates to innovate and integrate emerging technologies into their organization’s DNA so they can deliver on the evolving industry, market, and consumer demands, or otherwise risk failure. The most notable example of such failure is Blockbuster who failed to innovate and was forced to file for bankruptcy as they lost market share to Netflix. Corporations looking to stay relevant have established corporate innovation initiatives; however, most of these initiatives have failed. According to Harvard Business School Review, in 2016, it was estimated that 67% well-formulated strategies set by executives failed. Similarly, in a survey of 100 corporate innovation programs, they found that 81% of those surveyed said that fewer than 25% of their startup pilots have resulted in commercial deals. There are many explanations for this high rate of corporate innovation failure. 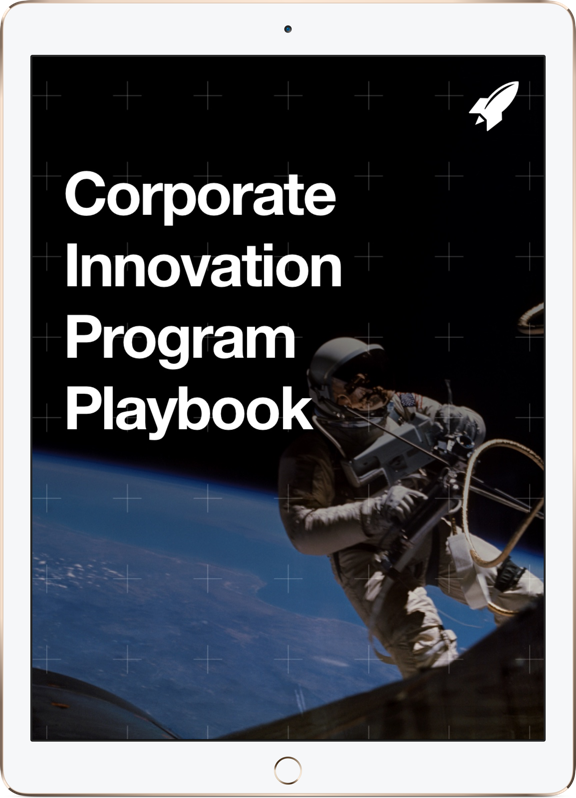 RocketSpace has a unique insight on corporate innovation programs since over 100 Fortune 1,000 companies have turned to us for innovation leadership. 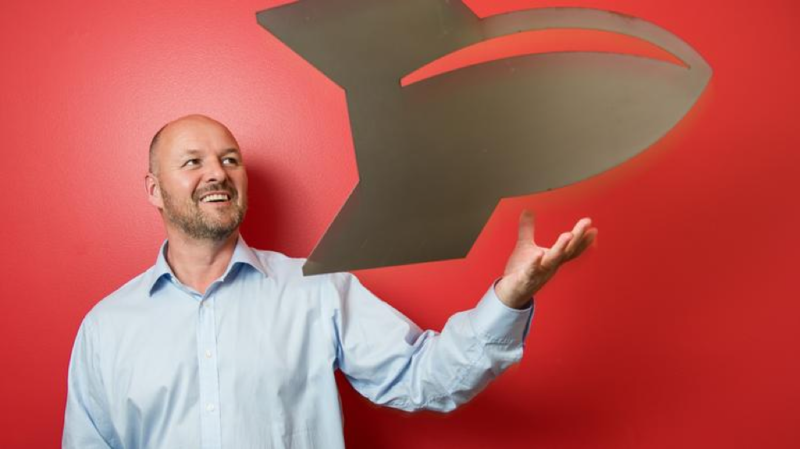 Below, our CEO, Duncan Logan, shares some tips on how your corporation can avoid failure and establish corporate innovation initiatives that will lead to success. Big companies are successful because they have implemented procedures and habits that maximize profit and minimize risk. However, these same procedures and habits are the ones that naturally tend to kill innovation initiatives. To achieve successful innovation, companies need to change previously established procedures, habits, and ultimately culture to be more open to innovation. In order to do this, it is essential for CEOs to not only support innovation initiatives but to also actively champion these initiatives. According to new research by Innovation Leader, 73% of innovation, strategy, and R&D executives say that leadership support is the biggest enabler of innovation and over 55% report that politics, turf wars, and a lack of alignment are the biggest barriers to innovation. It is clear that the biggest enablers and barriers to innovation are related to people, specifically who is responsible and championing innovation initiatives. As the ultimate decision maker, CEOs must deliver consistent innovation messages which not only support but also give priority to innovation initiatives. CEOs stating “we have a culture of innovation” is not enough. Since the outcome in innovation is unknown, it is essential for CEOs to state a clear vision and problem to lead their organizations toward a common goal. If people in organizations don’t understand why they should be innovating, it will be impossible for them to support any innovation initiatives. However, setting a clear goal is also not enough. CEOs must set clear innovation metrics to measure innovation progress in order to achieve success. 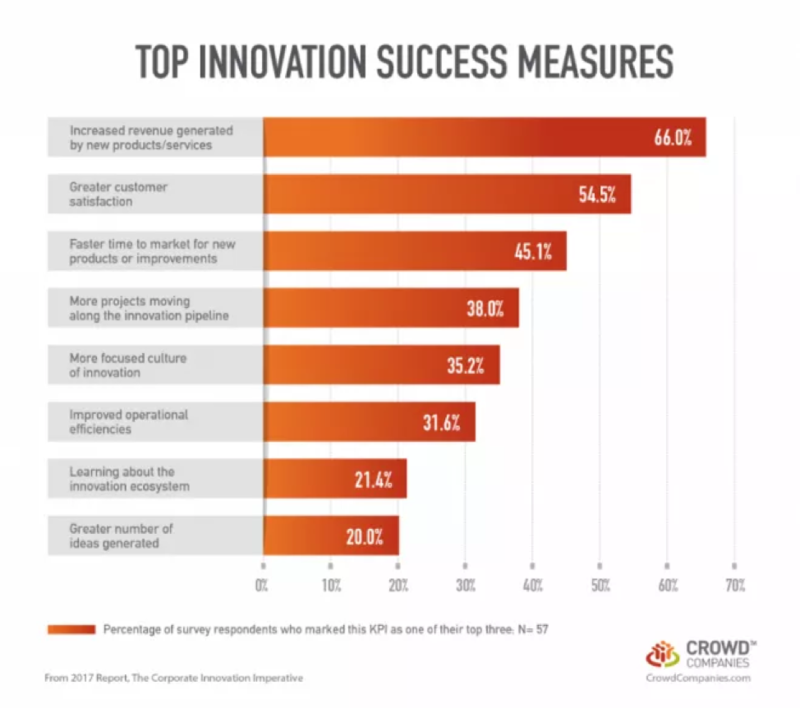 In a survey of 198 senior innovation executives, they found that the most commonly used metric to measure innovation is revenue generated by new products. The results of the survey highlight that CEOs are not tracking the correct metrics, which leads to failure. Traditional metrics, such as ROI, used to track progress in other parts of a business, don’t represent innovation progress accurately from infancy to maturity. CEOs must establish new metrics that move beyond conventional measures and focus on more tangible metrics which will be different in each phase of the innovation cycle. As you consider which measures to use, don’t limit yourself to only financial metrics. Research by Crowd Company found that corporate innovators who implement realistic measurement plans that focus on innovation KPIs, not immediate ROI, find greater executive support and are given adequate time to deliver results. CEOs need to recognize that the world has moved from Capitalism to Talentism. In this new era, talent has become the most important aspect of business - including innovation success. Corporates’ biggest competitive advantage is attracting, retaining, and inspiring innovative talent. However, one of the biggest hurdles CEOs are facing today is talent acquisition and retention. 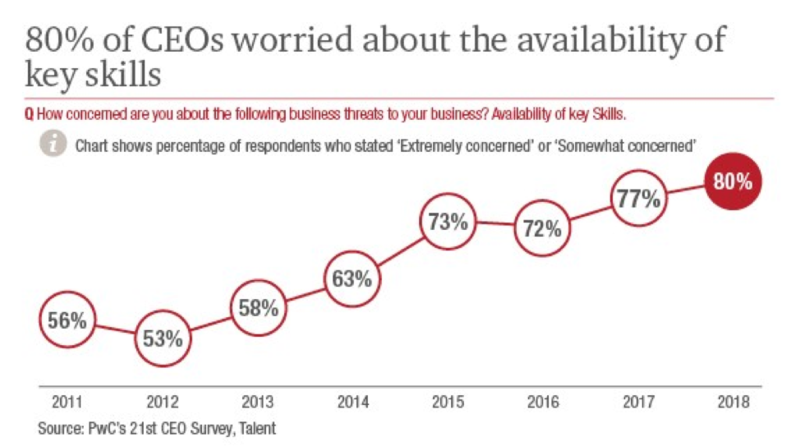 In a survey of 1,293 CEOs around the world by PwC, 80% of CEOs worried about finding and hiring employees with key skills they need to succeed in the digital world. Innovative people want to work at innovative companies - 47% of Gen Xers and 42% of millennials say they would leave their current job for a more innovative environment. Innovation is crucial for both attracting new talent and retaining existing talent. In order to change the perception that big companies are old and boring, it is essential for CEOs to promote their innovation initiatives internally and externally. You can read the book “The 2020 Workplace: How Innovative Companies Attract, Develop and Keep Tomorrow's Employees Today” by Jeanne C. Meister and Karie Willyerd for ideas on how to promote your organization as an innovative company. Rather than relying on a select group of individuals within your organization to generate innovative ideas, external innovation can enhance the breadth and quality of an organization’s exposure to new innovative ideas. Instead of waiting for your R&D department to develop their innovative ideas, external innovation can give corporations access to disruptive ideas and technologies available today. By accessing the external innovation community, corporations can minimize internal bureaucracy which often kills innovation initiatives. Internal R&D requires significant capital investment. On the contrary, external innovation provides various different financial models such as access to different capital sources and fractional ownership which can help turn around company’s decreasing returns on R&D efforts. In order to engage with the external innovation community, CEOs must paint a big, bright, red door with a sign that says “innovative ideas enter here.” The purpose of this door is to create a clear path for the external innovation community to reach the correct people in your organization with disruptive ideas or game changing partnerships. Once CEOs set up their red door, it is essential to develop a process clearly understood internally and externally on how innovative ideas will be evaluated. Incremental Innovation - companies focus on innovation on existing products for existing customers. Adjacent Innovation - companies take something they currently do well and apply it to new markets or develop new products for current markets. Disruptive Innovation - companies focuses on creating new offerings for new markets. CEOs must focus on identifying innovation in all three of these categories - the what's ‘now’ through to the what's ‘next’. Toys R Us failed to embrace digital transformation since it was outside of their core brick-and-mortar business model. Although 90% of Americans still shop at brick-and-mortar stores according to the latest census figures, the other 10% was enough to force Toys R Us into bankruptcy. When creating your innovation strategy, CEOs can’t afford to neglect one or more of the horizons of innovation. One example of how you might structure your innovation strategy is to follow the 70/20/10 rule. Companies that follow this rule such as Google focus 70% of their resources in improving existing technology (i.e. 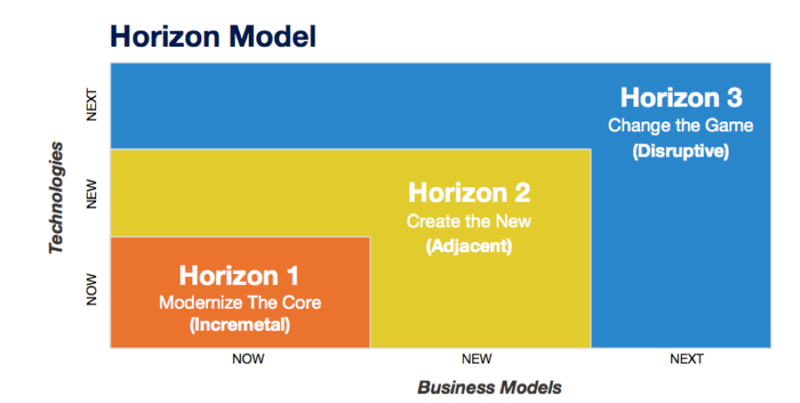 incremental innovation ), 20% toward adjacent markets (i.e. adjacent innovation) and 10% on completely new markets (i.e. disruptive innovation). In order to avoid being the next Blockbuster or Toys R Us case study, it is essential for corporations to continuously innovate. More and more corporations are establishing innovation initiatives; however, most of these initiatives are failing. According to our CEO, Duncan Logan, in order to obtain corporate innovation success, CEOs must champion innovation, have clear innovation goals and metrics, attract innovators, engage the external innovation community, and create and identify disruptive ideas.